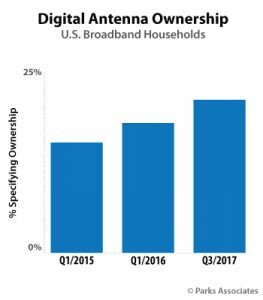 It might seem counter-intuitive in this era of on-demand entertainment and easy subscription services, but new data from market research firm Park Associates indicates that the percentage of US broadband households using digital antennas has been steadily increasing year-on-year, having reached a 20% residential deployment by the end of 2017. This figure is up 16% on the previous year, and the company goes on to reveal the increase coincides with a steady decline in pay-TV subscriptions and growth in OTT video subscriptions. Parks Associates suggests that the ‘high cost and low price/value perception’ are the main reasons for service and cancellation and bundle shaving, and more than 50% of households that have switched, pared back, or cut the cord believe the service is ‘not worth the cost’. Additional research has also shown that 63% of subscribers who cannot currently restart programs from the beginning find that feature to be appealing, 17% of consumers who cancel their pay-TV service would have stayed with their provider if there were no monthly fees for their set-top boxes, average fees for standalone broadband have increased nearly 25% since 2010, and 20% of Wi-Fi households experience problems with coverage in their home. I used to pay for basic local channels with TWC, but four years ago they stopped allowing me to use my TV tuner (or the tuners on my HTPC) and wanted me to lease a STB. No thanks. Bought an antenna the next day and have never regretted the decision. Had I known how much classic TV was available OTA (MeTV, Antenna, etc. ), I would have done it much sooner. I don't know about the USA but in Canada OTA is not viable for anyone outside of large urban centres located near the US border. Lack of OTA service still didn't stop me from canceling my cable TV service. Previous Previous post: The DVD day’s are numbered. Next Next post: The 13th Season of Gunsmoke due out on DVD on May 22, 2018…details following.